The average tech user has several devices he/she uses on a daily basis: a laptop, one or two smartphones, a tablet, maybe a fitness band and the list could go on. At a given moment, all these devices will run out of battery. If all these devices need to be plugged in at the same time, choosing which one gets charged first can be a tough call. The situation gets even worse when your parents’, roommate’s or friends’ devices also run out of battery. Who gets to revive his/her battery first? In order to avoid such annoying situations that could even trigger conflicts, we recommend you to purchase a desktop charging hub. Also known as a charging station, this device allows you to charge several devices at the same time. If you own a USB Type C computer, smartphone or table, check out the list below to see what the best USB-C desktop chargers are. This well-designed charger allows you to charge up to 10 devices simultaneously. 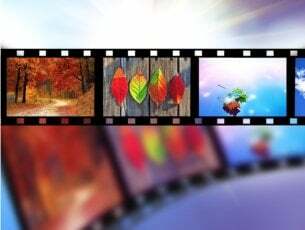 It supports charging mobile phones and tablets, including devices with thick cases. 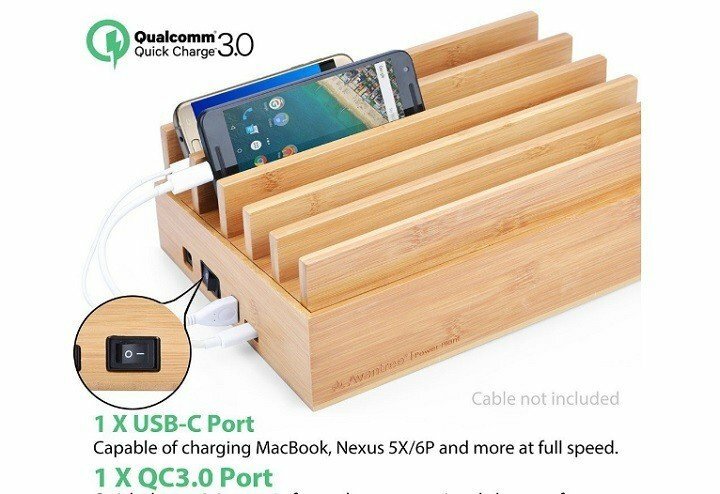 The special bamboo case makes this desktop charger a unique decoration at home and office. The provided cable ties let you easily manage all the charging cables and hide them underneath the box and declutter your desk. The built-in smart charging IC provides the maximum safe current for each device, protecting them from short circuits and overheating. Your Lumia 950 and Lumia 950XL will definitely love the Avantree desktop charger. The hub supports 1 quick charge 3.0 port, 1 USB Type C port and 8 smart USB ports. This charging station can charge up to 5 devices simultaneously and features 1 USB-C port and 4 USB ports. Thanks to the fast-charging PowerIQ and VoltageBoost technologies used in USB ports, the charging speed is maximized up to 8 amps, or 2.4 amps per port. 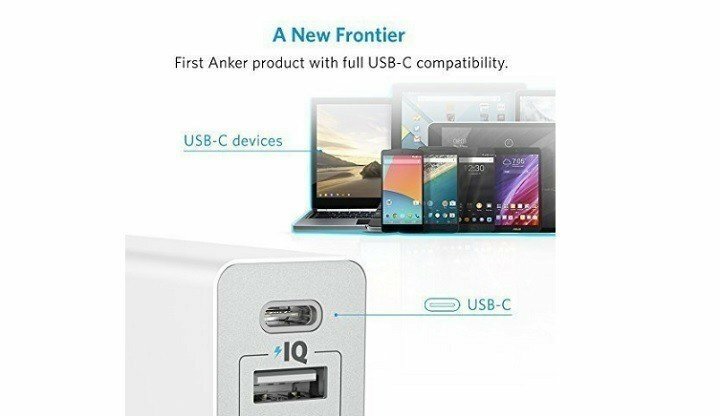 This model is the first Anker product with full USB-C compatibility, allowing users to charge USB-C devices at a full 3-amp rate. Thanks to the multi-security system, surge protection, short circuit prevention and more advanced safety features, your USB-C devices are fully protected. This review perfectly resumes the capabilities of the Anker USB/USB-C charging station: “Basically that’s it, Anker continues to provide great innovation with their USB-C line of products and like I said before the Anker PowerPort 5 USB-C will definitely exceed your expectations! 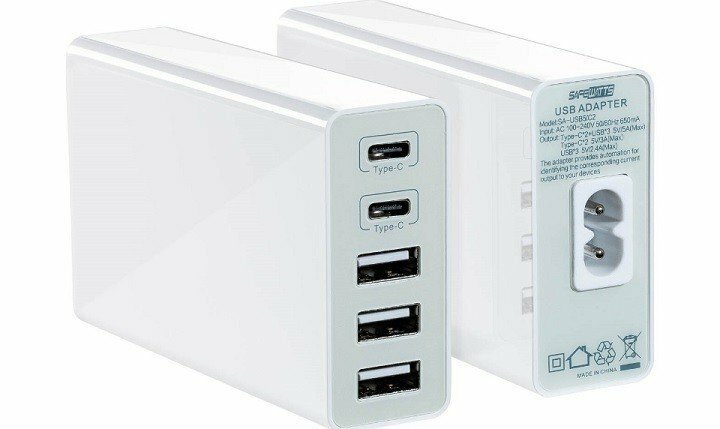 The Safewatts 5-port charger features two Type C charging ports and three USB 2.0 charging ports, allowing you to charge multiple devices simultaneously. One of the best features of this device is that each individual port automatically adjusts to your mobile device to give you safe, blazing fast charging speeds. 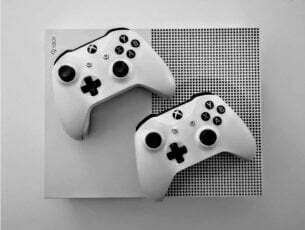 The type C ports and the USB ports provide distinct wattage for improved reliability. The Safewatts USB charger helps you save space while reducing the need to fight over every wall socket at home and is one of the very few charging docks to sport more than 1 USB-C port. Since the adoption rate of USB-C ports is increasing, Safewatts will definitely come in handy when there’s more than 1 USB-C phone in your house. Also, this USB-C charger is the size of the palm of your hand and doesn’t take up a lot of space. 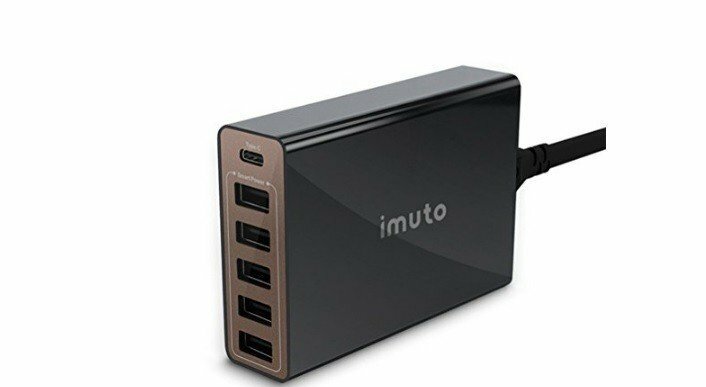 iMuto sports 1 Type-C port and 5 standard USB ports and can pump out 50 watts of power, charging 6 devices at rapid speed simultaneously. 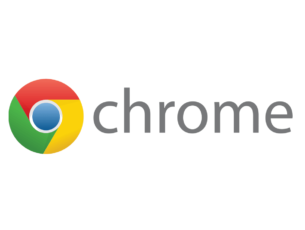 The Type-C port supports “positive and negative plug” function. Also, each charging port provides maximum charging speed when identifying your devices automatically. Rest assured, the iMuto USB-C charger keeps your devices safe from an over-charging, over-voltage, over-current, and short circuit. Users report that the charger has a slippery surface, lacking non-slip foot pads. Judging by users’ reports, the iMuto charging hub can’t charge Dell XPS 13, but the good news is that it appears this is the only device the charger is not compatible with. Thanks to the Qualcomm Quick Charge 3.0 Technology, this device can charge compatible devices up to 4 times faster. It is compatible with all USB and USB-C powered gadgets. The built-in safeguards protect your devices against excessive current, overheating, and overcharging issues. The AUKEY USB/ USB-C Charging Station also comes with one USB-C cable and one USB cable. The USB-C cable is 3.3 feet in length with a clip-on plastic closure. It is much thicker than the regular USB-C charging cables, which means it’s less liable to break when bent. The charging station itself is 5.7 x 5.6 x 1.5 inches in size and its excellent design allows users to place it on all sides without any problem. 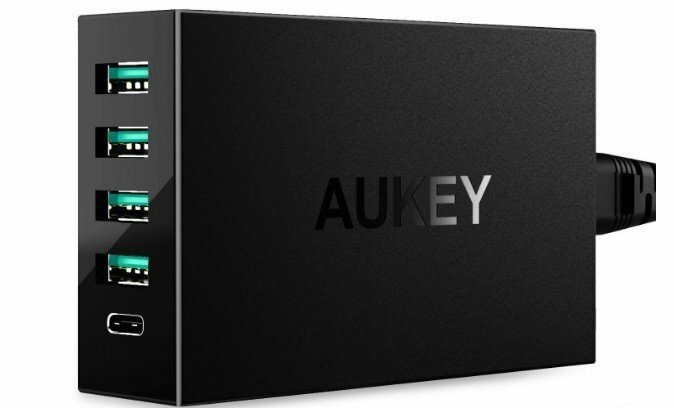 You can buy the AUKEY USB/ USB-C Charging Station for a price range between $30 – $35. 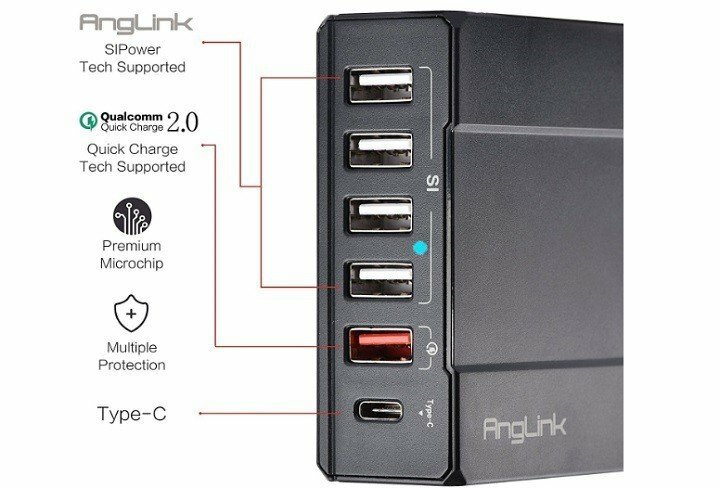 The AngLink Type C Charger combines all the latest charging technology, including 4 x smart-charging ports, 1 x quick Charge 2.0 port, and 1 x USB Type C charging port. It turns a regular power outlet into a powerful 6-port USB charging hub and multi- adapter for the desktop. The USB-C technology is the newest USB interface standard for data transfer and power charging. 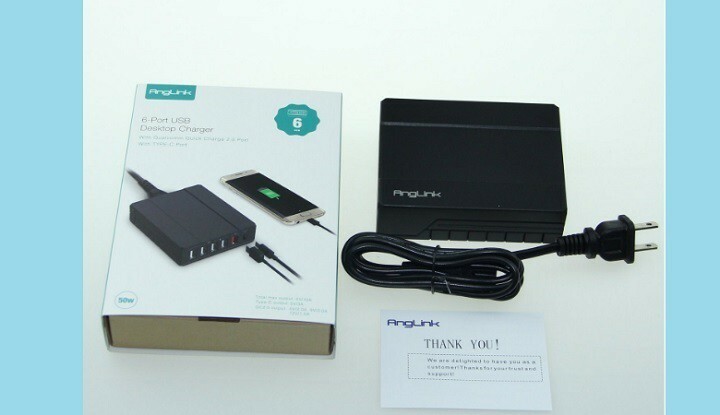 AngLink allows you to quickly charge your Lumia 950, 950XL, and other USB-C devices. Thanks to the smart circuit protection, temperature control, and other systems, this charging dock ensures complete safety for all your devices. The USB-C charging stations listed above offer a series of common features such as: USB and USB-C support, protection against power surges and fast charging speeds. When deciding which device to buy, take also into consideration the number of devices you usually charge simultaneously. If you’re planning to charge more than 5 devices at the same time, you can purchase the Avantree 100W charging station. If you want to charge 2 USB-C devices simultaneously, you should then purchase the Safewatts USB-C charger.